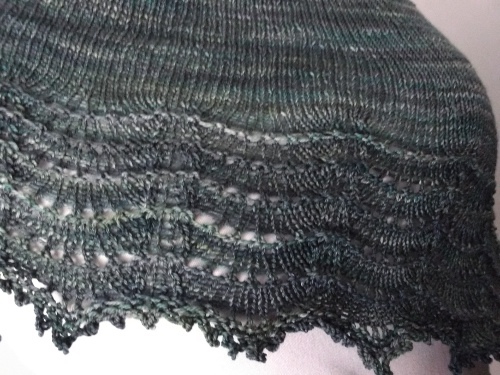 Normally I hate making shawls with variegated yarn but I think it's subtle enough here that it works well. I wound this yarn over a year ago and lost the ball band so I have no idea what colourway it is. Comparing it to others I think it's Aguas but it could be something else. This is my fourth project for the Ravellenics. After this things are going to slow down because this is my last instant gratification project. It took about two days but I probably could have finished it in one if I hadn't waited to make a decision on the extra repeat. 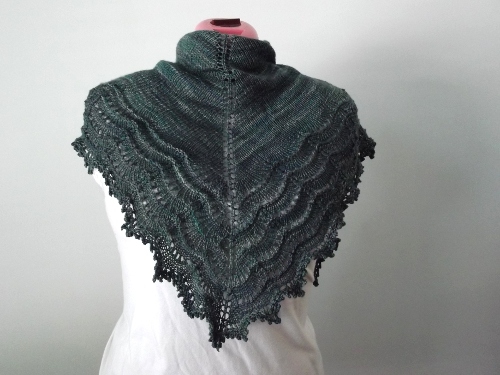 I did one extra repeat of the lace section and still had yarn left over for another but didn't want to risk it because sometimes that picot bind off can really get you in yardage. The bind off didn't take nearly as long as I thought it would. And it's not as small as I thought it was going to be but I think blocking really helped open it up. I'm really loving the texture on this. And it's such a quick project that doesn't require a lot of yardage and has an easy to remember chart that I'll probably make a couple more eventually.